For Wednesday with Donna Hay this week, Chaya chose Donna's apple slice recipe. You can find it online here. I loved this version of apple slice, with a shortcrust base and crumbly topping, and not overly sweet. It is way nicer than the commercial bakery version. It was also a hit at work - it disappeared very quickly. Someone actually said that you can't buy stuff like this - so true. To see what Chaya, Sarah and Margaret thought of this delicious treat, visit their websites. On 4 December, I attended our work Christmas party at Encore at St Kilda Sea Baths. The theme was Arabian Nights, complete with a belly dancer. On 5 December, I went to Hobart for the weekend, staying at the beautiful Henry Jones Art Hotel. I dined at an old favourite, The Drunken Admiral, and went on a ferry trip to MONA. I also picked up some more gorgeous plum pudding jam from Amanda Jammm at Salamanca Market. On 14 December, I went to a first birthday party for my friend's adorable Yorkie - it was a wonderful girlie afternoon with bubbles and nibbles and chat (for us, not the Yorkie). On 19 December, I went to see The Beatle Boys at The Palms at Crown. I adore these guys - if you can't see The Beatles (which you can't), The Beatle Boys are the next best thing. This is the second time I have seen them, and they were even better this time around - more relaxed and funny. I also had front row seats - yay! Highlights were the lively banter between "Paul" and "John", "Ringo's" enthusiastic drumming with hair a'swinging, George's" awesome rendition of "While My Guitar Gently Weeps", and "Paul's" sparkly baby blues. Go see The Beatle Boys - they're great! On 20 December, it was the legal team's Christmas function at my boss's new house. Family and friends came along, and we sat out on the gorgeous covered deck while we indulged in fabulous food cooked by my boss and his wife, including prawns, buffalo wings, lamb chops and salads, and ate my pavlova roulade and Gingerbread Buche de Noel for dessert. It was a wonderful afternoon. On 21 December, I attended the 158th anniversary service at my friend's church. Afterwards, there was an enormous potluck to feed the masses. I am currently with family for the Christmas break. What have been the highlights of your year? Was it a good one for you? And what is exciting you for 2015? Would love to hear your thoughts. Have a fabulous New Year one and all! My last Christmas goodie bag treat that I have to share with you is fruit mince pies. I used the Chocolate, Fig and Ginger Fruit Mince that I made to fill pastry cases made using Margaret Fulton's recipe, which is available online here. The pastry is not as buttery as some, but the bonus for the baker is that it is easier to work with, even though I do prefer the buttery but notoriously pernickety short crusts. I have some fruit mince left that I am going to use to make Christmas donuts from Donuts by Tracey Meharg that Tim gave me for Christmas. Good fun! When making my Christmas box goodies, I made a boo boo with the gingerbread men. For the gingerbread men, I intended to use the Bourke Street Bakery recipe. A slight problem arose when I tried to watch TV while making the dough at the same time. I misread the ingredients and added white sugar instead of brown sugar to the dough - oops. What to do? I didn't want to waste all that dough, so I rolled it out, cut out Christmas shaped cookies from it and baked them. 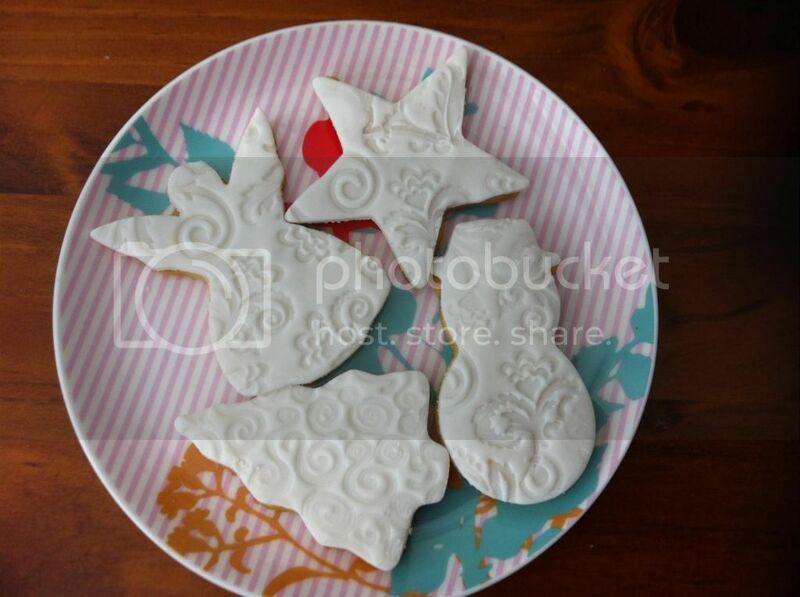 I then decorated them with rolled fondant patterned using an embossing mat, which I stuck onto the cookies by brushing the cookie surface with warmed apricot jam before applying the fondant. A winner! People loved these, even though they were the accidental cookies. I think it looks cute, although it was fiddly to do. Have you had any recent baking mistakes that you were able to come back from? If so, what happened and how did you fix it? I'd live to hear your stories. Happy Boxing Day! I hope that you all had a wonderful Christmas day celebrating with family and friends. Snickerdoodles are buttery cookies rolled in cinnamon sugar. They are crisp on the edges but soft in the middle. While my Snickerdoodles did not turn out textbook pretty, they smelt fabulous in the oven and they sure tasted amazing. I ate two straight off the bat and had to put the rest away before I ate any more. This cookie recipe is a definite keeper! Whisk together flour, cream of tartar, soda, and salt and sift again. In separate bowl or stand mixer, cream together butter and 1 1/2 cups sugar until light and fluffy. Add in eggs, mixing well after each addition. Preheat oven to 400 degrees Fahrenheit/ gas mark 6. Roll dough into walnut-sized balls, and roll in cinnamon sugar mixture. Place the balls two inches apart on cookie sheet that has been greased or lined with baling paper. Bake the cookies for 8-10 minutes until cookies are done, but still soft. Let cool for a few minutes, then transfer to cooling rack. To see what the other Doristas made, visit the LYL section of the FFWD website. Merry Christmas to everyone! I hope that you have a fantastic day with family and friends. As part of the December baking whirl, I made gingerbread men, pictured at the top of this post. I used this recipe from Margaret Fulton. To decorate, I used cinnamon chips for the eyes, chocolate chips for the buttons and a sliver of glace cherries for the mouth. Simple, but oh so cute. I will be celebrating Christmas quietly with my family. How will you be celebrating Christmas Day? For Wednesday with Donna Hay this week, Margaret chose Donna's hokkien noodles with sesame chicken from Fresh Food Fast. You can see a list of ingredients here. This was a great choice - exactly the kind of thing that I like to eat. I substituted the miso paste for tahini, which gave the dish a lovely nutty flavour. It was also quicker to make than my Asian greens from last week! I would definitely make this again. For Tuesdays with Dorie this week, we have a festive recipe from Baking Chez Moi - a Gingerbread Buche de Noel. Don't you think it's pretty? It looks like a snowy log out in the field - or at least an artistic impression of one. I made this recipe for my team Christmas party - I was happy to have a special occasion to present it. This recipe has numerous steps. I made the cake one night, and the pecan praline, filling and frosting the next, along with assembly. Although there were a number of steps to make this cake, none of them were difficult. I have made roll cakes before, but I liked Dorie's tip about using a ruler and paper to get the roll a bit tighter. The base cake is a gingerbread sponge roll. It is filled with a cream cheese, butter and pecan praline mixture, then topped with a marshmallow frosting and chopped pecan praline. You can find the recipe online here. I took the tip from some other Doristas to only make half the frosting, and that was plenty. The frosting was very addictive, as was the pecan praline, which proved very simple to make. 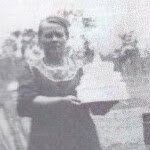 Overall, I understand that this cake was a hit. I certainly enjoyed it. To see how the other Doristas went with this cake, go to the LYL section of the TWD website. This was meant to be marble fudge, made using a recipe from the December 2014 edition of Taste magazine. Here is a photo of what is ought to look like. Umm, mine doesn't really look like that at all. The fudge is made using the microwave method, which I have never used before and am not a fan of. I think it is harder to gauge when your fudge is right than on the stove top. My fudge is brown with some reddish bits rather than red and white swirled. Ahem. However, if you put all of that aside, this fudge tasted really good - like old fashioned Russian caramels. A colleague of mine was in raptures over it and asked for the recipe. A fast and tasty treat for Christmas party nibbles is this recipe from Table for Two for Maple Cinnamon Spiced Nuts. I Googled relentlessly to find a recipe for spiced nuts that was spicy but not too hot, as last year, comments were passed on the heat in my spiced nuts, which took some by surprise. As it happened, these fit the bill, and the recipients of my gift parcels declared these nuts good. This is a recipe I'd definitely use again. My friend Craig is allergic to gluten and dairy, so for his Christmas gift this year, I baked him a batch of traditional German cookies called Haselnussmakronen, or hazelnut meringue cookies. The recipe for these cookies is online here. I actually forgot to toast the hazelnuts, but I don't think that it mattered. 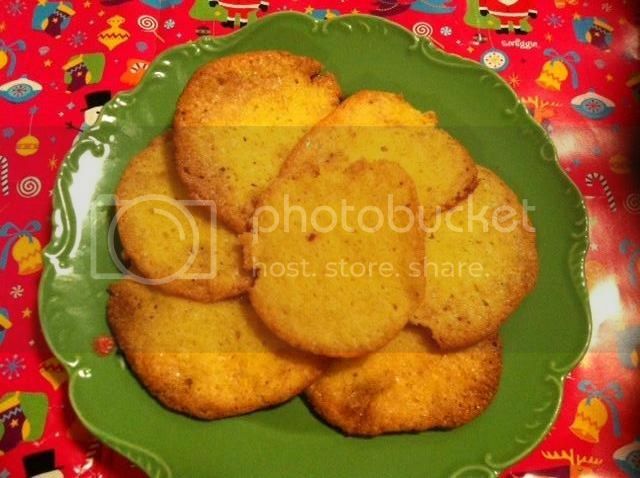 The cookies turn out quite dry and crisp, so would be good for dunking in tea or coffee. While I prefer buttery cookies, these make a nice change and are perfect if you are gluten or dairy intolerant. French Friday with Dorie this week has an unusual offering - Orange & Olive Salad. This is pretty much what it says on the tin - oranges, olives, red onion, olive oil, salt and pepper. I didn't really like this much - the salty flavours did not go with the orange on my palate, but other people enjoyed it, so there you go. To see what the other Doristas made of this dish, visit the LYL section of the website. Tuesday was my colleague Vlad's birthday. Vlad's favourite type of cake is cheesecake, which he makes known several times a year by asking when I am going to make cheesecake. Accordingly, cheesecake is what I made. The recipe I used was Junior's New York Cheesecake, as published on the Epicurious website. I had wanted to make this cheesecake for ages - ever since I saw a travel article naming the author's top 5 New York cheesecakes. Junior's cheesecake was declared the best by the author, and from my research, he is not alone in that view. This cheesecake was quite straightforward to make. I used the 9" crust with the 8" filling and was glad I did - the 9" pan was full to the brim once the cheesecake baked up in the oven. I really liked the ultra-light, barely there sponge crust. I do like some form of crust on my cheesecake as a vehicle for the filling, and this sponge crust is perfect. I also enjoyed the light fluffy filling which the recipe authors aptly described as being like billowing clouds. I wrote on the cheesecake with piped caramel filling. I received heaps of compliments on this cheesecake at work - a sure sign it was better than average because people often say nothing about my baking because I do it so often. Two people even asked for the recipe. If you are a cheesecake lover, I highly recommend that you give Junior's recipe a go. For Wednesday with Donna Hay this week, I chose Asian Greens with Oyster Sauce from p82 of Modern Classics Book I. The sauce recipe is online here. 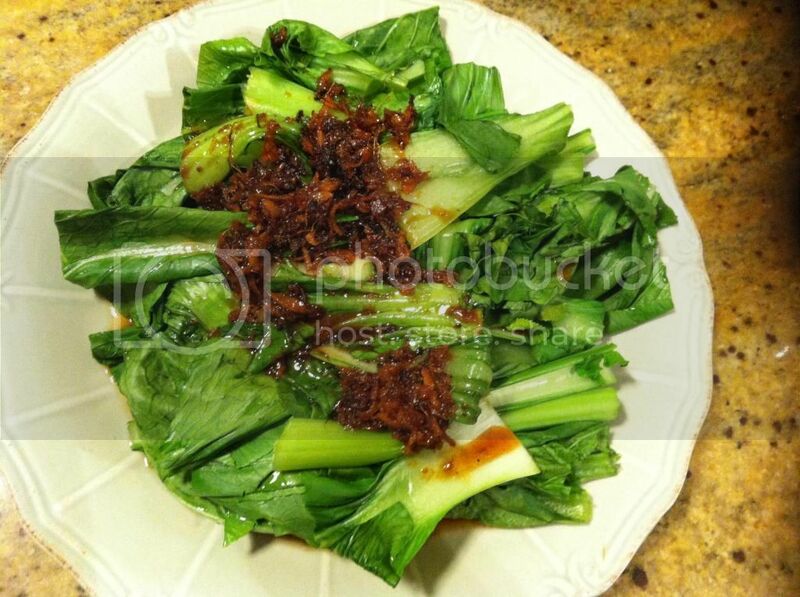 This is a simple dish of two bunches of Asian greens that have been steamed, then topped with an Asian flavoured sauce including rice wine, soy sauce, ginger and garlic. I found that this dish took a long time and a lot of fussing for something so simple, but it tasted good. However, in the future, I'll stick with the faster stir-fry method. For FFWD this week, our recipe was Lamb & Dried Apricot Tagine. Now this is my kind of dish! I love the fruit and meat combination, and the sauce was delightful. If you love a good stew, the recipe is online here. To see what the other Doristas thought of this dish, visit the LYL section of the FFWD website and inhale the aroma. It's scarily close to Christmas now. I hope that your preparations are going well for the big day. Back in October, I commenced my Christmas preparations by making a Christmas cake and a Christmas pudding. For this year's pudding, I chose Margaret Fulton's Rich Christmas Pudding from Margaret Fulton Christmas. You can also find the recipe online here. Christmas pudding is my favourite part of the Christmas day meal. We always have it with lashings of warm custard and vanilla icecream. No matter how full I am from the main meal, there is always room for Christmas pudding. I liked this pudding recipe because it didn't require heaps of expensive glace fruits - just sultanas, currants, raisins and mixed peel. It also turned out really well, even though I only had time to steam it for 5 hours instead of 6. I will shortly be slicing up my pudding for Christmas gift boxes. I am hoping that there is some left over for me to try! 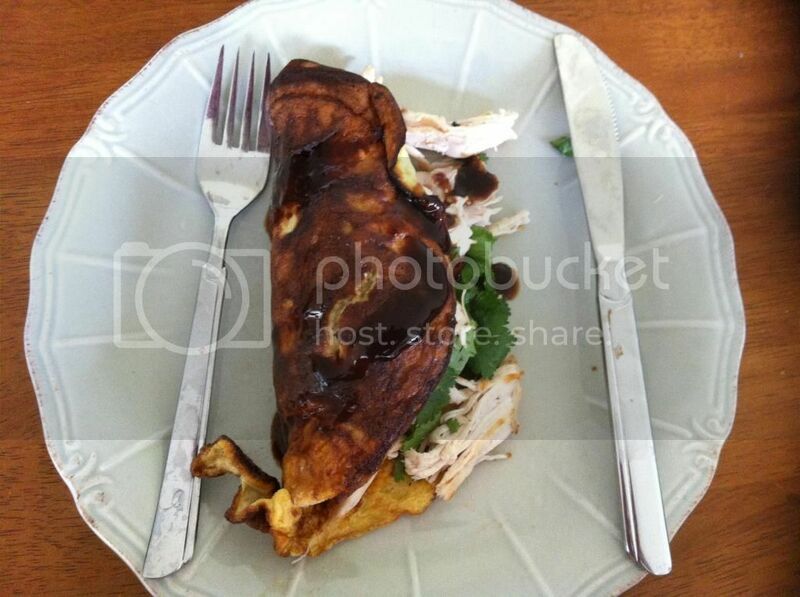 Sarah has chosen Donna's Asian Chicken Omelette for Wednesday with Donna Hay this week. The recipe is from Donna Hay Magazine, although you can find the ingredients online here. I didn't bother putting the raw snow peas, bean sprouts or chilli on top, as I knew I wouldn't fancy them. I added coriander to the omelette, and used hoisin sauce on top instead of kecap manis. I still found it a little dry, so I added some chutney to the chicken. This was a nice enough meal, in fact the kind of thing I'd normally eat for breakfast. It would be nice with a salad. To what Sarah, Margaret and Chaya thought of this dish, visit their websites. This week's Baking Chez Moi recipe is The Rugelach That Won Over France. I am not sure that my rugelach would have won over France, as they are not that photogenic, but they sure are tasty. Rugelach are made with a cream cheese dough, which is spread with melted butter and cinnamon sugar, topped with chocolate, fruit, nuts and coconut, then rolled up, washed with egg, sprinkled with sugar, sliced and baked. I found the dough quite hard to work with as it seemed to tear quite easily. However, even if my rugelach are not the prettiest around, I really liked the flavour of the melted chocolate with the coconut, toasted pecans and raisins. To see what the other TWD bakers thought of these cookies, visit the LYL section of the TWD website. Today is my manager, Mark's, birthday. Our team has bought him a pressie, and I have made him some cupcakes. To make the cupcakes, I used the chocolate cupcake recipe from The Primrose Bakery's Cookies and Cream Cupcakes, recipe in their book and online here. Once the chocolate cupcakes were cooled, I iced them with a thin, smooth layer of The Primrose Bakery Vanilla Buttercream - recipe here. As the finishing touch, I topped each cupcake with a fondant disc printed with a musical notes chocolate transfer sheet from Roberts Confectionery, using the hairdryer technique demonstrated here. This was the first time I had tried this and I was very pleased with the results. The significance of the musical notes is that Mark is very musically orientated, so I am sure he will appreciate these musical cupcakes. I highly recommend trying this decorating technique using chocolate transfer sheets to decorate ready to roll fondant - it is not too difficult and is so effective. I am loving Ruby Tandoh's columns in The Guardian, and recently was totally suckered in by her recipe for Rhubarb and Custard Splits, online here. I did not see Ruby in GBBO, but I am enjoying watching the very first series of GBBO, currently on TV here. Edd Kimber is such a sweetie and fun to watch, especially as I have followed GBBO religiously from its inception through The Guardian. For a twist, I used sour cream (because I had some) in the crème patisserie and homemade peach jam instead of making rhubarb jam. People at work thought these buns were scones, but regardless, they seemed to eat them. I really liked these buns, which is no surprise given my adoration for custard. The buns are a little fiddly to make, but are super easy - all you need is a little time. This week's French Friday with Dorie features another "stuff on toast" (to borrow from Trevor) recipe. The stuff is breasola or prosciutto (in my case, the latter), walnuts and oil on buttered grain bread. I added some mustard to spice things up a little. This tartine was totally serviceable but just not very exciting. Without the walnuts, it would have been downright boring. For WWDH this week, Chaya chose Roasted Carrot and Herb Dumpling Soup, the recipe for which is available online here. This soup is easy enough to make although it takes some time because you have to roast the carrots. The colour is glorious, but the soup was just OK. My favourite part was the herb dumplings - don't skip them, they are terrific. To see what Chaya, Margaret and Sarah thought of this soup, visit their websites. The Caker featured a recipe for Gluten Free Raspberry, Almond and Rosewater Muffins on her blog. I think they looked really pretty so I decided to print off the recipe and make them. In the end, they turned out a little bumpy, were not really springy, and I found the almond meal texture odd. When I read the comment, I realised that this happened because the method leaves out the addition of the eggs, and because I was working from the method, not the ingredients, the eggs were left out. The resulting muffins were totally edible and they were polished off at work, but without the eggs, were more like rock cakes or similar than muffins. I am glad that I satisfied my curiosity and made them, but I won't be revisiting these muffins. Recently, I saw the most wonderful looking Pear Streusel Coffee Cake on Liz's website. I fell in love with it instantly and printed off the recipe. Shortly thereafter, I decided to make it, as I happened to have some tinned pears in the cupboard and was looking for something to make with them. Liz's spicy cake seemed perfect! I replaced the pecans with cashews simply because that is what I had, but otherwise left the recipe alone. The resulting cake is very moist and pleasantly spiced. It was a big hit at work, and it is definitely a keeper. Thanks to Liz for sharing the recipe.